the quartet is internationally renowned for its exciting performances, award-winning recordings and their devotion to the French repertoire. 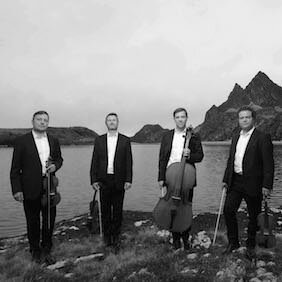 Winners of the Evian International String Quartet Competition, the Debussy Quartet performs about 80 concerts a year in Europe, Asia, and North America. They are regular guests at distinguished concert halls (Concertgebouw in Amsterdam, Auditorio Nacional de Musica in Madrid, Grand Theatre in Geneva, Konzerthaus in Berlin, Théâtre du Châtelet, Musée du Louvre in Paris) and are also heard at many of Europe’s finest festivals. The Debussy Quartet’s extensive discography includes the acclaimed Decca label release of the landmark Mozart Requiem recording. The quartet’s mixed chamber music repertoire includes its highly regarded CD of the Brahms and Weber clarinet quintets with clarinetist Jean Francois Verdier and a highly acclaimed collaboration with the pianist François Chaplin in several Mozart piano concertos. Further, their discography includes the complete works of Webern for string quartet for Harmonia Mundi, which received the coveted Choc award of Le Monde de la Musique.